Plans to create calmer, greener streets on the Wiggle came into clearer focus Tuesday after the SFMTA presented more refined proposals for raised crosswalks and intersections, bulb-outs with greenery, traffic circles, traffic diverters, and other safety improvements. The proposed treatments [PDF] are aimed at improving stormwater drainage while also calming motor and bicycle traffic. One newly proposed measure to help address the growing number of complaints that an increased number of bicycle commuters are making the streets uncomfortable to walk across is “in-pavement speed reduction bars” on approaches to crosswalks. Those, planners explained, would be strips of colored material much like the green-backed sharrows already along the Wiggle aimed at signaling bicycle riders to prepare to yield to pedestrians. “We can’t force anyone to stop, but there are physical improvements we can do to make it so that you can see what’s coming sooner and act accordingly,” said Miriam Sorrell, a planner with the SFMTA’s Livable Streets team. While the original aim of the project was to add greening improvements along the traditional Wiggle bicycle route — topographically, the flattest way across the lower Haight — the SFMTA and Public Utillities Commission are now considering deviating from the route for two blocks, placing improvements on a block of Pierce and Page Streets instead of the corresponding blocks of Haight and Scott Streets. That’s because permeable pavement treatments that would go underneath the parking lanes on Haight wouldn’t be able to bear the loads of Muni buses and delivery trucks which often stop there. Sorrell said the pavement treatments are mostly intended to absorb stormwater, though they can contribute to calming traffic by narrowing the visual width of the roadway. The other reasons to consider the two-block deviation, SFMTA planners say, are that many bicycle riders have said they deviate on to Page and Pierce anyway, and that Scott would still have reduced car traffic if the street is blocked off to cars in at least one direction, as the agency proposes to do. The motor traffic diverters could be added on Scott at Oak or Fell Streets, creating a dead-end for drivers in one or both directions, preventing them from using Scott as a cut-through route. People walking and biking would still be allowed to filter through in both directions, and the SFMTA has also proposed adding a traffic circle at Scott and Page to calm that intersection further. Although the proposals to divert motor traffic raised concern from some pro-parking activists at a recent meeting (even though little if any car parking would be removed), the Wiggle proposals seem mostly well-received. “A lot of these ideas would improve that experience,” he said. Although there haven’t been any known injuries involving bicycles on the Wiggle recently, we continue to hear reports of SFPD stings, where officers ticket bike commuters who don’t fully stop at stop signs — even people who safely do an “Idaho stop,” a practice used even by SFPD officers themselves — which saps limited police resources but doesn’t necessarily make anyone safer. Sorrell said raised crosswalks could be added at every Wiggle intersection with stop signs. Along lower Haight Street, existing stop signs at Scott and Pierce could be traded for traffic signals as part of the Muni Transit Effectiveness Project, which is being developed separately. That proposal is aimed at speeding up the 71 line (the signals would have transit priority), and SFMTA staff said those intersections aren’t slated to get bus bulb-outs under the TEP. The Wiggle improvements are currently scheduled to be completed in mid-2016. These traffic calming treatments will go a long way towards helping to build acceptance of cycling as a commuter mode in the lower Haight. Moving the wiggle to Page makes a great deal of sense. The corner of Haight and Pierce is a real conflict spot, with the downhill grade on Haight, bus shelter, bus stop and narrow sidewalk blocking sightlines from Haight onto Pierce. It’s where I see the greatest number of speeding cyclists as they swing right onto Pierce. This is one of the more well thought out plans that the MTA has proposed. Just goes to show that when car storage and vehicle LOS aren’t the overriding priorities, they can be pretty creative. Still – 3 more years of the current conflicting conditions. Sigh. Most of the plan is pretty good for street greening, but it seems like the circulation plan was thought up by someone who doesn’t live in the neighborhood. I don’t know why they’re wasting so much energy on Pierce. I ride it every day. 90% of the riders turn L on Haight to avoid the hill. Very few cyclists come down Pierce, but it seems to me that a vast majority of cyclists use Page when traveling east, and use the Wiggle when going west. The idea of the Wiggle being mostly a one-way route hasn’t really sunk in yet. I like the increased bulb-outs and the bio-swales should have been started 10 years ago. I think that Waller between Steiner and Pierce would be a great place to install a Woonerf (http://en.wikipedia.org/wiki/Woonerf) to see how bikes, peds, and cars would interact in a space not constructed with the convenience of drivers as a primary goal, and ped/bike amenities as an afterthought. I also asked them to address the dangerous situation on Page between Webster and Octavia, where every morning idling cars clog the street, forcing cyclists to either risk getting doored, or ride in the opposing traffic lane. They said MTA was working on it, like MTA was working on it 5 years ago. The jam-up also adds 10-15 minutes to the Eastbound Haight Street bus commute every morning. They have developed a solution, but for some reason it will take until 2017 to implement it. Ah, didn’t have a chance to link to the boards earlier (here they are) but I mentioned that the diverters could be at Oak or Fell (depending on public input). 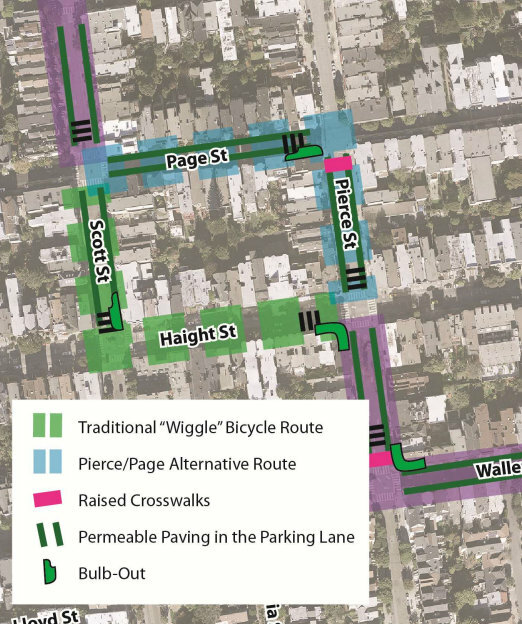 I went to the open house and as I understand it, there is a proposal to either put ‘green treatments’ on Pierce/Page _OR_ Haight/Scott and not to change the actual path of the bike Wiggle. That was stated clearly twice to me by Luis of MTC: “The Wiggle’s path will not change.” There were a half dozen pros/cons to both proposals. My preference is that the green treatments should go along the Wiggle, even if they are less comprehensive on Haight Street. 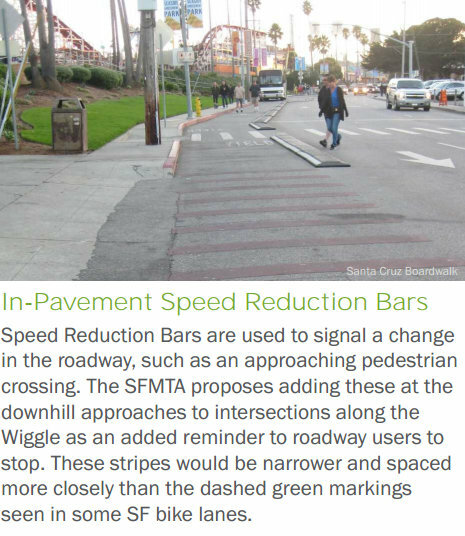 My reason: the prominence/visibility of green treatments on Haight will make the Wiggle more visible and will promote the Wiggle to more people (Haight is busy) however they choose to travel Haight Street. The MTA’s plans have great potential to improve the Wiggle for its residents and for those who travel through on foot, bike, and transit. These plans really seem to offer everyone an improvement. (Motorists, please take note that improved transit and improved bike and pedestrian infrastructure results in more people travelling by those modes, leading to less traffic congestion.) Raised intersections would enhance pedestrian safety and calm traffic at select locations on Page and on Waller. The proposals to speed up Muni (with signal priority and other improvements) are great. If motor traffic diverters are installed on some Scott Street (or how about Steiner?) locations, the effected blocks could be calm, quiet urban oases ideal for local residents and visitors as well as for pedestrians and cyclists. Woonerfs, yes! 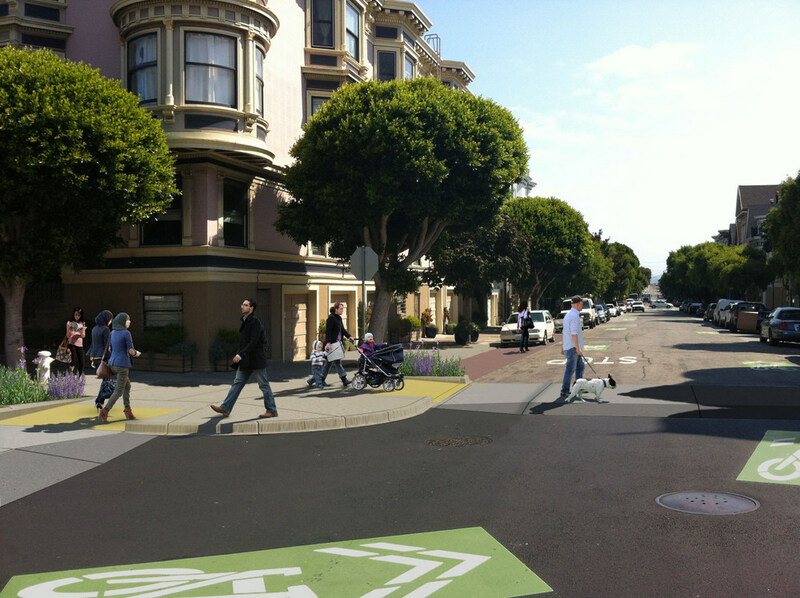 There are many such streets in SF that could benefit from this treatment. Maybe that is the next logical extension of the Pavement to Parks concept? Why are they not considering traffic circles at each intersection? It seems like that would be the simplest way to calm traffic for both bikes and cars while also improving pedestrian safety. Am I missing something here? Woonerf is a concept that shouldn’t be applied to US cities. There was a traffic circle project on Page some years back, but it was a failure. The implementation was pretty half-hearted and so it wasn’t clear to anyone how to negotiate the treatments. Luke, those circles were tried a few years ago and nobody liked them, so they were taken out again. I happen to think circles work well, and certainly do so in Europe, but culturally Americans just don’t get them or do them. An ideal suburban or residential U.S. street, with kids throwing a football and biking in the street or shooting baskets in a driveway or at the curb, is kind of like a woonerf. Informally at least, the concept has roots here, too. I am curious as to why you object. While I’m in favor or some measures to reduce traffic speeds and make some streets safer to cross and whatnot, I think a street is, and shouldn’t be, a place for kids to be playing at, or for any activity other than transportation (of people, bicycles, cars etc). Anything else should be done on backyards, designated (and if possible supervised) playgrounds, parks and other off-street areas. Oh Dear Daddy, I would like to go play! No problem young Jeeves, run out into our spacious San Francisco backyard! No Daddy, I would like to go to the park! No problem son, go to Golden Gate Park, where you can get a free lesson in the handling of a loaded handgun! Man, when you get people wandering in from Streetsblog.net, the average comment quality really takes a hit here. That’s one of the huge reasons not to implement something so poorly designed that it can’t possibly function. Everyone for the next twenty years says “we tried it and it didn’t work,” when, in truth, it wasn’t really tried at all, and no one knows whether it might actually work. Traffic circles work very well in place of four way stops in Seattle. In Sedona, AZ roundabouts were recently put in place of four way traffic lights. And of course they work beautifully all over Europe. The problem with San Francisco’s current roundabouts is that they require a stop first which defeats the purpose. If San Francisco wanted to be only five years behind Europe instead of forty, it could try entirely uncontrolled, shared space intersections with raised crosswalks. The rules are pedestrians get right of way, all other traffic must slow down, look, and proceed (no faster than, say 8 mph) only if no pedestrians. Thank you for your response and explanation. Certainly, some streets clearly have too much traffic to allow for safe non-transportation uses in the roadway. However, it is worth noting that non-transportation uses of streets help to make them safer – because there are more eyes and ears on the street.